They say, "When one door closes...another one opens". No worries, I'm not going anywhere! 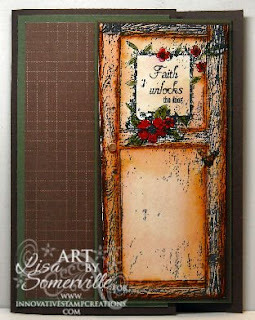 Innovative Stamp Creations just released a beautiful set - Open the Door the images are a unique way to let others know they are in your thoughts & encouragement to persevere. 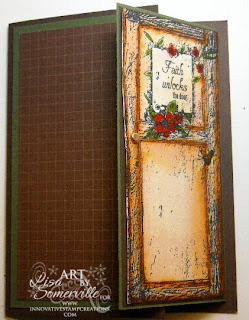 I created these cares both with folds that allow the card to be opened to reveal the sentiment or writing you wanted to put in the inside of the card. Both images were stamped in Black Archival on watercolor paper, colored using the Marker Watercoloring Technique. This first card uses the ZFold Technique. 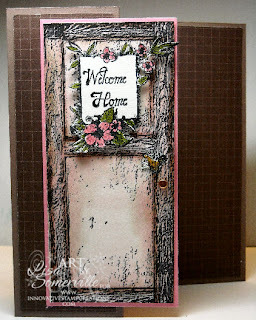 I stamped the flower panel, watercolored it, then popped it up on the door, then used my SAMJ to stamp my sentiment. This card uses the Flap Fold Technique. When opened your message or sentiment will be on the Artichoke card stock. Wow these are gorgeous the doors look so real. Makes you want to reach out and open them. Great art Lisa! Your Blog is superb! I am giving you the award Scrapzine Tag. You can visite my Blog to receive your tag.